The company has since issued this admirably detailed statement. In short, the security team recently discovered suspicious activity on Cerberus servers. The attackers were able to get away with stolen usernames and encrypted passwords, but no other data. Just shy of 100,000 accounts were affected, and to play it safe, the company has secured the affected accounts by disabling their current passwords. 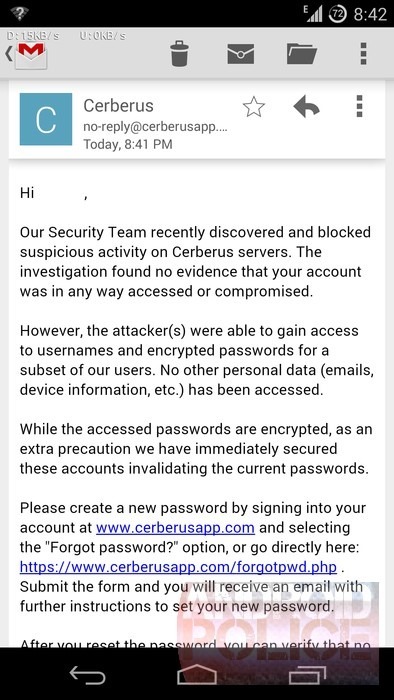 Those users will have to change their passwords and can do so at: https://www.cerberusapp.com/forgotpwd.php. - A total of 96564 accounts had their password reset and have been notified with the email communication above. These accounts have not been accessed in any way. - A total of 3 accounts were accessed by the attackers, before we blocked their activity and reset the passwords. Those 3 users were notified before the others with a different email communication. - As of March 26, none of the data obtained by the attacker was released publicly, that we know of. This incident follows a similarly frightening situation seven months ago, where a determined hacker could potentially use brute-force methods to find the IMEI numbers of user devices and remotely activate some of Cerberus's functions. That security hole has since been fixed. The Cerberus team consists of three people, and it looks like they have their hands full. Still, we commend them for their transparency. 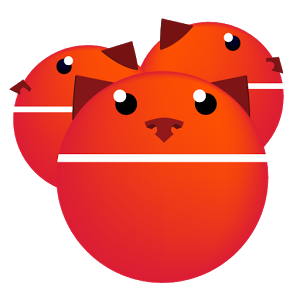 Here is the Cerberus support forum for anyone who would like additional communication. Thanks, Chris, Abhilash, and everyone else who sent this in!